Huawei promised us "mooore" for its next flagships, and today it really delivered... the kitchen sink of specs and options thrown into two notcholicious phones, the P20 and the P20 Pro. Well, technically, there is a third one, the P20 Lite, but that one was already launched even without the official announcement to pad the midrange. So, what did the world's third-largest cell phone maker out today that is so exciting? Well, how about the first triple camera phone with giant 40MP sensor to boot, but read on. The P20 and P20 Pro both sport the trendy notch which Apple uses to house the Face ID camera kit on the iPhone X, while Android makers use to boost the screen-to-body ratio bragging rights. Thus, the P20 houses its 5.8" display in a body barely larger than that of a 5.2-incher, and ditto for the 6.1" P20 Pro whose size is akin to the 5.5-inchers of yesteryear. Love it or leave it, the phones are entirely made of glass, which shines in beautiful dual color gradients at an angle. The P20 Pro is water-tight at up to three feet, with IP67 certification, while the P20 is simply water-resistant against splashes and such. 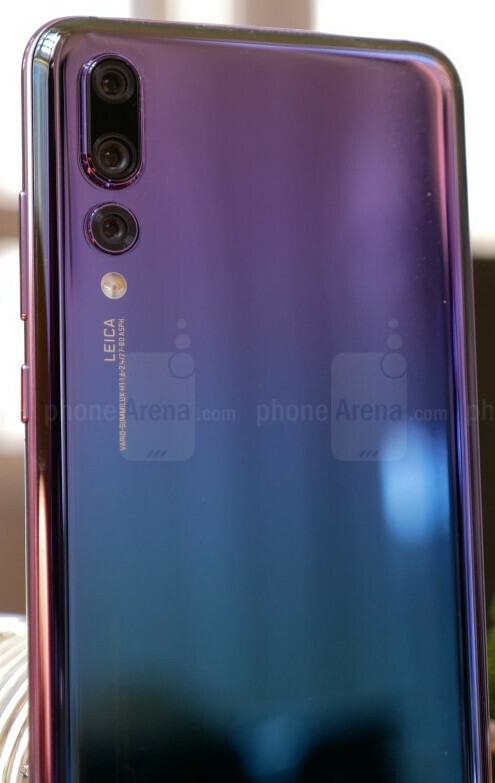 Besides the stunning good looks brought along by the gradient glass chassis (the blue version radiates in light purple gradients when tilted, for instance), Huawei crafted a smart approach to the notch, too. Knowing that Android P will introduce full support for screen cutouts, it went ahead and installed one, but it is much narrower than the notch on the iPhone X, as Huawei made the speaker mesh round, instead of elliptical, saving space in the process. It's not down to the level of the original notch-y Essential Phone, but that one only houses the front cam there. In any case, the notches on the P20 and P20 Pro look (gasp) palatable, while the rest of the design is quite shiny and attractive. Thankfully, Huawei didn't go with Quad HD resolution, but equipped the P20 and Pro with Full HD+ panels, which immediately translates to better battery life compared to those 4+ million pixels that have to be lit up at all times on QHD+ handsets. The P20 houses a 5.8" RGBW LCD (yes, LCD) screen with 1080 x 2240 pixels, ringing in 18.7:9 aspect ratio, or about 2:1 if you don't count the horns. The P20 Pro has a slightly larger. 6.1" OLED panel with the same resolution. The RGBW technology is usually brighter than regular LCDs, on account of the extra white pixel, but we have to measure it before we pass any judgement. Huawei says it hits up to 770 nits, which is in line with our previous experiences, and 25% more than what the iPhone X or Galaxy S9 are able to muster, for instance. Huawei's newest flagships are running on the homebrew Kirin 970 chipset, which is built with a modern 10nm process, and is an octa-core endeavor that goes up to 2.4 GHz, so you won't feel underpowered by any measure. A fine 4GB/6GB RAM batch will make sure apps load and keep well in memory on the P20/Pro, while the internal storage options start from 128GB. Generous fast-charging 3400 and 4000 mAh battery packs keep the light on, while the P20 and P20 Pro still manage to stay at the sub-8mm thickness mark to be considered thin and elegant. We just got to the best part of Huawei's new handsets, the cameras. While you have a flagship-grade Leica dual camera on the P20, with 12MP RGB + 20MP monochrome sensor at f/1.8 and f/1.6 apertures, respectively, and giant 1.55 micron pixels, the P20 Pro takes it up even further with a camera unseen on a thin and light Android handset so far. How about a huge 1/1.7" sensor with 40MP resolution? Check. A dual setup with 20 MP monochrome and 8 MP telephoto lens? Check. Pixel size 61% larger than iPhone X, and 22% larger than S9 to collect more light at 1.55 microns? Check. A 4-in-1 hybrid focusing system with color temp sensor, laser and phase-detection autofocus? Check. The highest light sensitivity levels on a smartphone camera of up to 102,400 ISO? The first phone with 3x optical zoom thanks to the telephoto lens? Super Slow Motion with with 960 FPS super slow-motion at 720p like on the S9? Check, check and check! Oh, did we forget to say that Huawei has a new fast camera mode that can grab a picture from a locked screen state within 0.3 seconds. well, there is that, too, and now the only thing left is to take samples. Lots and lots of samples, and compare those to the Pixels, Galaxies and iPhones of this world. 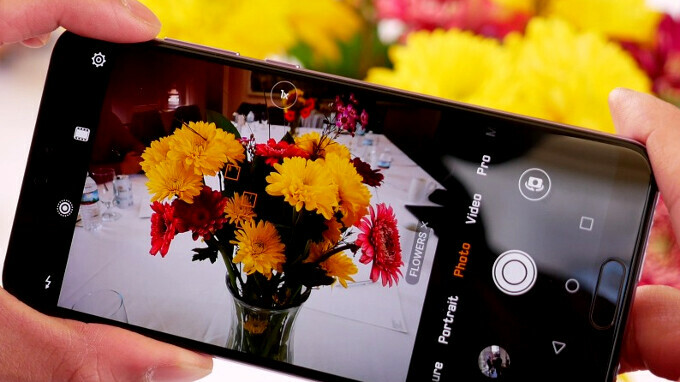 Needless to say, Huawei throws in its own take on a camera AI, which, as you can see from the header, identified with ease that we are shooting flowers, and adjusted accordingly. The front cameras are the same, with whopping 24MP resolution, portrait lighting, and facial recognition that serves to unlock the phones if you are so inclined. The Huawei P20 will be available in black, champagne gold, twilight, pink gold, and midnight blue color options, while the P20 Pro eschews a champagne gold version. Release is today for the P20, and April 6th for the Pro - the phone's prices demonstrate that Huawei is aiming at the very best, with the P20 Pro expected to cost €899 in Europe, €50 lower than the Galaxy S9+, while the regular P20 model should be available for purchase at €679, set strategically lower than the S9. Mum's the word on US pricing and availability - at least until the US trade war with China, geopolitical considerations might prevent the finest members of Huawei's high-end portfolio from appearing on US carrier rosters. What do you think, are you impressed with what Huawei has managed to pull off here? Ugly notch and thick lower bezel and no headphone jack. Dumbest ripped off design ever. Do you feel a pain ? I can forgive the notch since it is small and doesn't look like the wide iphone eyebrow. Lower bezel is ugly because of the button but I don't think it's thick in real life. I dig the simplistic back, skins will look great on it. It doesn't look like essential phone or xiaomi mi mix 2s but other hardware might make it one of the best phones of 2018. But that thick lower bezel is put to good use and houses a front-mounted fingerprint sensor, which is absolutely great ! They can put it on the back or on the side like previous Sony phones. Notch design is pointless. You can hide the notice from setting if you don’t like it. The pro got the be#t camera rating on DXO mark 109 followed by ordinary P20 103 Beats S9 plus, iPhone X and pixel 2 xl . The notch is lovely, small and symmetrical, the best I've seen so far. Can be hidden in settings too. Really looking forward to seeing the camera samples. They revived lumia 1020 camera in huawei's phone. It's not. Best cameraphone of all flagships! Lol, Ciro,since when you trust in dx0mark that you post examples of their work? 100% sure PA will revive their "Monsters from Asia" articles because of P20. "Monster P20 Pro brings triple 40MP camera" Misleading news title. No doubt the P20 pro completely overtakes the Mate 10 pro. The size is ditto, amoled screen by which p20 pro will have the same monster battery life of Mate 10 pro, but now with monster camera as well. Triple camera is insane can't wait for the review!